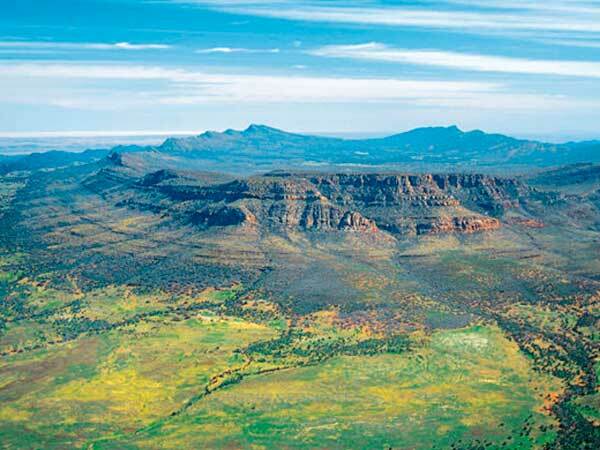 Experience the best of South Australia’s Flinders Ranges – a timeless place created at the dawn of time! See stunning historic rock formations, incredible valleys, beautiful rockpools and creeks lined by majestic towering Gum Trees. Unique dining experiences including all breakfasts, lunches and dinners. This morning passengers are transferred to Adelaide Central Bus Station to begin this exciting tour into Australia’s Most pristine and spectacular natural wonders- The Flinders Ranges. Our tour takes us into South Australia’s Mid North area and we travel through a mixture of old abandoned small towns once vital water stops for the old Stream Trains and little farming communities. We arrive at Burra around midday where we enjoy a Hearty Country Lunch at the Burra Hotel. Burra is a historic township which played an important role in South Australia’s history. The town has many magnificent stone buildings crafted by Cornish Stone Masons who arrived here during the copper mining rush. In 1845 Burra had a population of 10,000 people who lived and worked here due to the discovery of copper. After lunch we take an interesting town tour which includes a group of miners’ four roomed cottages which were built during the mining days to help with housing. The Red Ruth Jail was also built in Burra and was used in the filming of the Australian movie Breaker Morant. Our tour continues to Peterborough which was one of the important towns in South Australia at the time. This was due to the unique turn table which allowed passengers to transfer to trains of different gauges which allowed them to continue to all corners of Australia. On arrival into Peterborough we check in our motel suite for our overnight stay. Following dinner this evening we experience a spectacular Sound and Light Show on the Australian Steam Rail history at Steamtown. This morning after breakfast in Peterborough, we continue north into the amazing Flinders Ranges, travelling along the RM Williams Way to Carrington & Hawker. After a stop for refreshments, we visit the popular Outback Art Gallery operated by artist Geoff Morgan. Amongst the local artwork on display is an amazing panorama of the Flinders Ranges. We continue to Wilpena Pound for a picnic lunch. The Pound is a bowl shaped mountain range used by the early station owners as an operating Pound to contain their stock within boundaries. After lunch, you will have the opportunity to experience a panoramic flight over parts of the incredible landscape which features magnificent century old gum trees, valleys, rock pools & craggy outcrops. After the flight, we travel to Quorn for our overnight stay. After breakfast, we take a short tour to Warren Gorge before boarding the 10.30am Afghan Express or Pichi Richi Flyer on a 32km scenic journey on the old train line to Woolshed Flat via Pichi Richi Pass. The train returns to Quorn at about 1.30pm. After lunch, we begin a tour of the Flinders Ranges. Our tour takes us into the amazing Parachilna Gorge, Angorichina & the Great Wall of China. Panoramic valleys and never to be forgotten stunning lookouts over colourful & primitive landscapes are quite amazing. We tour back to Quorn via more stunning lookouts throughout the Flinders Ranges National Park. Dinner is included at the Great Northern Lodge this evening. This morning its goodbye to the Flinders Ranges as we begin our journey south. We travel to James Town and Spalding as we continue along to R.M Williams Way named after the well known former Drover who founded the famous R.M Williams brand outback boot and clothing manufacture. We continue through the Mid North grazing lands and pass through long abandoned little railway towns to the beautiful Clare Valley. The area is famous throughout the world for the fine wines that are produced here. A special lunch awaits us at a local historic Winery Cellar Door in Clare where we enjoy a unique wine and food experience here. After our delious lunch, we continue on our journey to Gawler then back to Adelaide arriving approximately 5pm.